It’s very hard for any moving company to make being green an initiative. After all, moving isn’t exactly great the for the environment but there isn’t a way around it…that is unless we are to revert back to a horse and carriage! So, we do our best to be an environmentally friendly moving company by tackling initiatives at our own office and in our own daily routines to curb the affect of our trucks being on the road. Our latest initiative is composting! Between our movers and our office staff, a lot of food gets consumed in our Toronto office. It is a shame to see the remains tossed into our disposal bin. 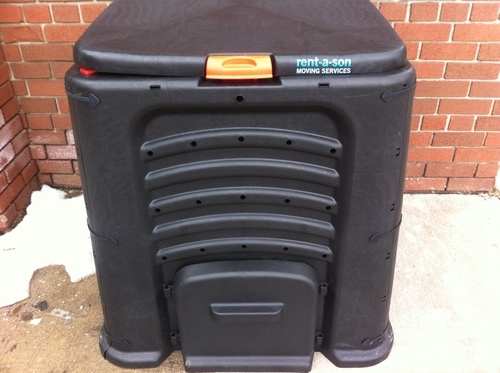 So, this week, we purchased a composter and began depositing our leftovers in the bin. We look forward to using some of the compost, once broken down, as fertilizer for our seasonal vegetable garden. If you have any other ideas for how moving companies can stay green let us know!